Keith Hasting is originally from the Detroit area but has called South Florida his home since 1995. Keith has a wide range of experience in sales, management, and marketing. He brings a genuine and dedicated work ethic to any project and has a strong focus on customer service. Keith has extensive advertising and internet marketing expertise and is a Project Manager and Partner at Times Ten Creative, a premiere Fort Lauderdale marketing and advertising agency. This experience makes Keith an excellent choice if you are looking for an agent who knows how to market your property and bring potential buyers through the internet. Clearly, once Keith list your property, he goes well beyond the typical realtor and knows how to market it to sell. As an original Midwesterner, Keith specializes in helping clients who want to relocate from colder climates or simply want to purchase a tropical winter retreat. He is happy to take the time and effort to walk buyers through this process with comfort and ease. 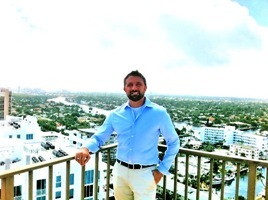 When looking for a leader in South Florida Real Estate companies to interview and work for Keith Hasting met with Broker and Owner John Castelli of Castelli Real Estate Services & Castelli Luxury Division and both found a common goal= outstanding and unsurpassed expectations for their clients. With the areas best and most talented agents John Castelli knows the stress and demands for todays home shoppers and buyers. With a strong understanding of Palm Beach, Broward and Miami-Dade Counties, Keith feels a personal responsibility to each individual Buyer and Seller: outstanding customer service is his number one goal. In Keith’s free time he enjoys cycling, running, kayaking, traveling, architecture and Florida’s beaches. Keith currently lives in Oakland Park and is excited of the many new things happening in his city.